No guessing here what you’re going to run into. Traveling with my family to Bucks County PA was a trip for both business and pleasure. As a guest of Visit Bucks County, I was determined to explore first hand what fun things the area had for kids to do, outside of Sesame Place. Shopping and eating in Peddler’s Village was my “fun” but as I always say, family travel is about balance – identifying things that everyone can enjoy while on vacation. During our trip, the heat was a bit oppressive. If you’re not heading to a water park, who really wants to be outside in high temps and humidity? The indoor play area of Giggleberry Fair was a perfect escape from the weather. 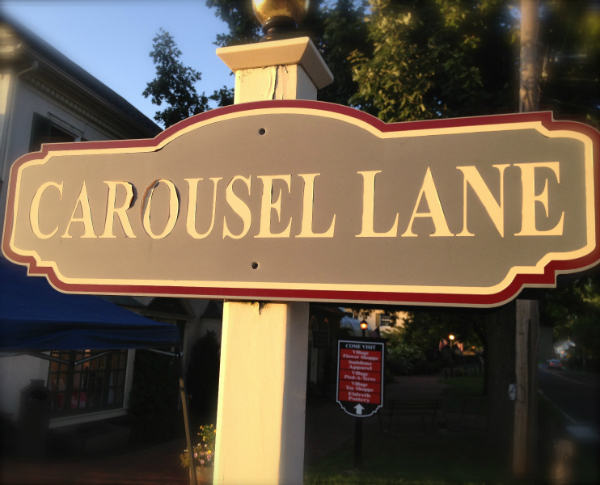 The highlight of this low key mini-amusement space was its restored carousel where the animals and artwork have been carefully re-painted by local Bucks County artists. Kids also have the option to climb through the obstacles of Giggleberry Mountain and for the younger ones, play at Giggles Discovers. The $12.99 activity pass is an economic option if your child would love unlimited rides on the Grand Carousel in addition to access to the other areas of Giggleberry Fair. A few miles away from Peddler’s Village in New Hope, is the New Hope and Ivyland Railroad. On its tracks run historic diesel and steam locomotives complete with restored 1920s vintage passenger coaches and bar car. Hopping aboard the train and riding through the countryside of historic Bucks County was the highlight of our trip. Trains are usually a big hit for kids and so it was with mine. The train ride is a 45-minute narrated history lesson of the area. The first class car affords you a beverage and plush air-conditioned surroundings. A day and a half in Lahaska and New Hope was sufficient time to explore what the area had to offer us. Just around the corner from the New Hope and Ivyland Railroad is the Bucks County Children’s Museum. Unfortunately, it was closed on Monday, the day that we had free to visit but at least we know for next time. Visiting Bucks County makes for a quiet retreat from the hustle of city life with just enough to offer both parents and kids.